I-Stretch & Strengthen grew out of a need to provide my clients with a basic exercise routine as both a part of their rehabilitation and a need for continued development of flexibility and strength. Clients wanted a routine that did not require a gym or equipment, and one that could be used while traveling for business, pleasure and at home. I-Stretch & Strengthen can be used as a guide and a beginning for learning more about your body by engaging physically and focusing on the language of sensory experience. A heightened awareness of your body is a step closer to the larger understanding of self-awareness, personal growth and insight. The human body...psyche, spirit and structure are one, and in being so when one aspect of self is neglected the others fall prey to imbalance, illness and injury. Through caring for the body's needs physically and emotionally, health can be created to provide vitality and the opportunity to live a passionate life. The human body has an inherent design that is meant for movement and adaptability. Modern life too often has us moving much less than our body's require to maintain good health. Recent studies have equated sedentary life as being similar to smoking and the potential for health problems which can arise. We simply need to move our body's more to stay healthy. I-Stretch & Strengthen provides a concise exercise program to build flexibility and strength as well as becoming acquainted with the sensations which arise from exploring different types of movement. The sensory experience is the language of the body which is the subtle information to keep us on track physically. 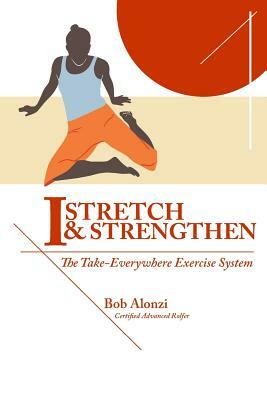 The exercises contained in I-Stretch & Strengthen are time tested. They provide a solid foundation for developing and improving balance, movement and strength. Whether you are rehabilitating from an injury or trying to get back to the activities you love, I-Stretch & Strengthen builds a solid foundation for advancing and reclaiming the full potential of your body. BOB ALONZI has been in private practice as a Certified Advanced Rolfer in Santa Monica, California for over 30 years. His interests in sports and physical activity have led him to take special interest in athletic and traumatic injuries along with injury prevention and rehabilitation. Bob has worked with professional and recreational athletes from many different sports in addition to aerialists, cyclists, gymnasts, modern and classical dancers. Bob is an avid cyclist and enjoys endurance sports and activities including hiking and kayaking. His regular exercise routine includes, Pilates, Yoga, Pickle Ball and Gardening.